This information is specific to the deprecated version one. For more up-to-date details, see: our Developer Portal. 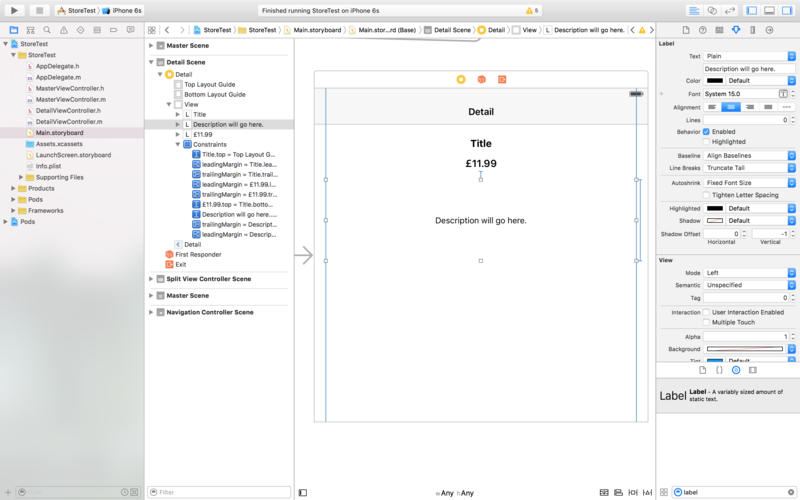 In this tutorial, we’ll be taking you through the process of creating your first iOS mobile store app with Moltin in Objective-C. The Moltin iOS SDK offers the perfect solution for mobile developers looking to incorporate eCommerce into their iOS app quickly and easily, all through native Objective-C or Swift code - and entirely without the pain of having to write, deploy and host a backend. The backend is entirely managed by Moltin, meaning you can work on creating great mobile store experiences for your iOS users without any fuss, developing high-quality native eCommerce apps rapidly with the Moltin iOS SDK. 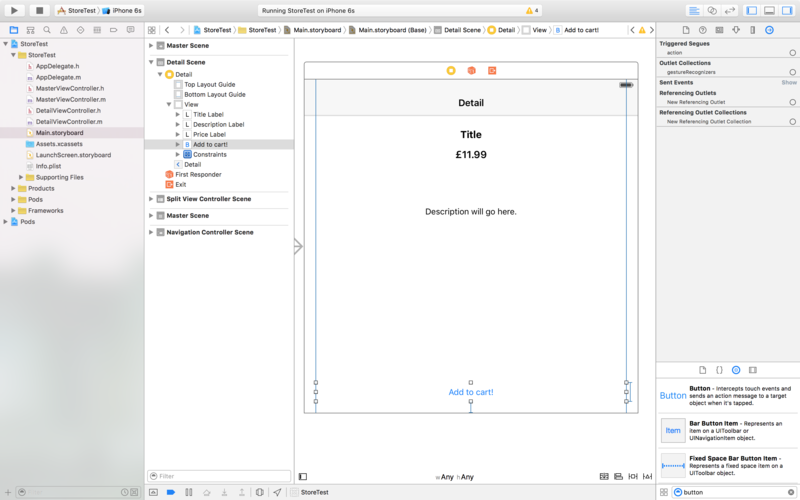 Firstly, create your Xcode project using the Master-Detail Application template. 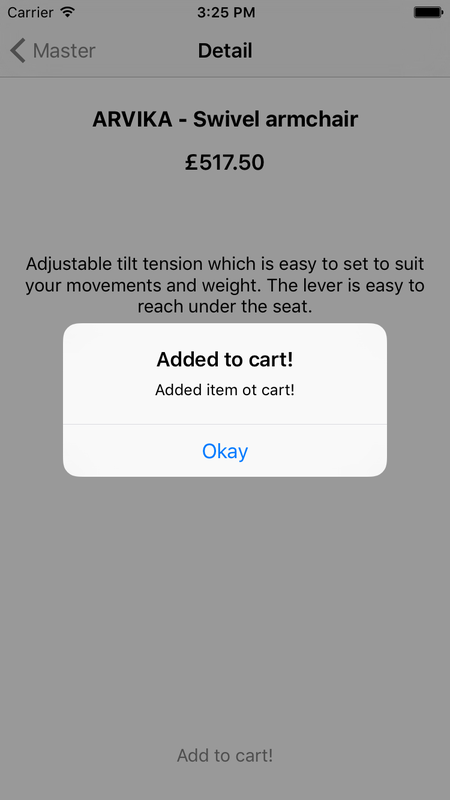 In this template, the masterUITableView will display the store’s products, and the ‘detail’ view will contain product information. Then, open a new Terminal window in the directory of your project and run `pod init` - this will get your project ready for CocoaPods. Open up the Podfile in your project directory using your favorite text editor, and add the line pod ‘Moltin’, this will add the Moltin SDK to your project. Then, run the pod install command in Terminal, open up the created .xcworkspace in Xcode, and you’ve successfully installed the Moltin iOS SDK. Now, find your store’s Client ID from your Moltin account - you’ll need to include this in the app in the next step of this tutorial. 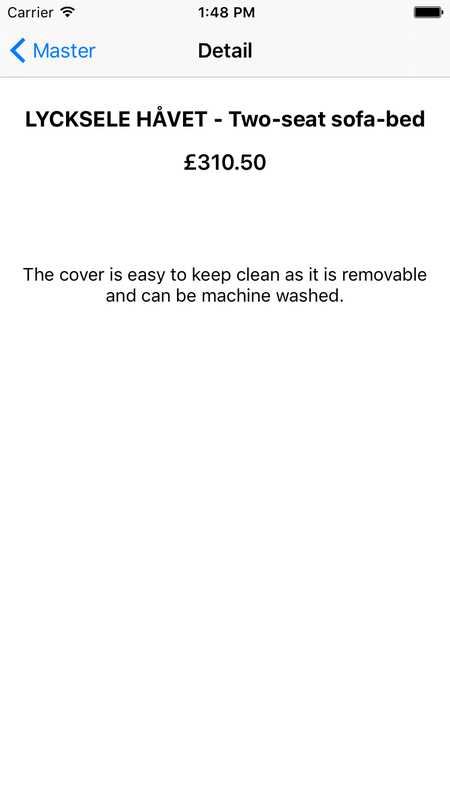 Also, ensure that you create some mock products in your store so that you can see them in your iOS app. You can do this via the API or from the backend dashboard. Head to the MasterDetailView.m file in your Xcode project and import the Moltin SDK by adding the line #import <Moltin/Moltin.h> at the top of the file (underneath the other #import statements). Then, in the viewDidLoad method in that file, add [[Moltin sharedInstance] setPublicId:@"YOUR_STORE_ID"]; (obviously replacing YOUR_STORE_ID with the client ID of your store from the Moltin dashboard). This initializes the SDK for use with your Moltin store. This code uses the SDK's listing WithParameters method, with empty parameters, to return every product in your store from the Moltin API, then populates the objects array with the returned products, and refreshes the table view that we’ll be displaying your products in. This creates a table view cell with the product’s title as the cell’s text. As you can see, this code gets the values from the detailItem dictionary (which contains the product information as a dictionary), passed to the detail view instance from the master table view objects array), and sets the relevant label text string values to the values from the product dictionary. Then, go to the DetailViewController.h file and declare a method -(IBAction)addToCart:(id)sender;Go back to the Main.storyboard file and wire it up to the Touch Down event on the Add to cart button. Go back to the Detail ViewController.h file and add #import <Moltin/Moltin.h> at the top, with the other import statements. So, items can now be viewed and added to the cart - next stage, checkout! Now that we’ve got items added to the cart successfully, let’s look at how to implement checkout with the Moltin SDK. 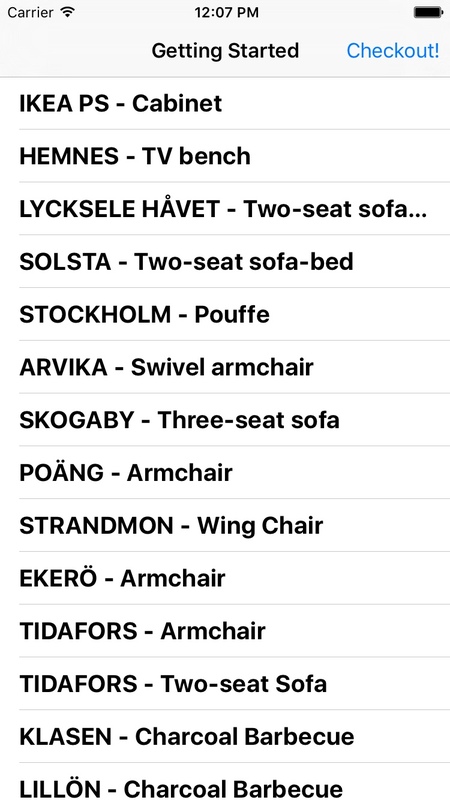 In your production iOS apps, you’ll be offering beautiful checkout interfaces where users can enter their details elegantly (you can see an example of what we suggest in our iOS Example App project on GitHub here), but in this example, we’re going to hard-code the checkout details into the app to keep the tutorial as easy to follow as possible. // You'll likely always want to hard code 'gateway' so that it matches your store's payment gateway slug. // We'll show a UIAlertController to tell the user they're done. As you can see in this checkout method, we’re creating dictionaries containing user order data and payment data (hard-coded in this example, but in real life production apps this is the data you’d be getting the user to enter in a series of text fields), then calling the orderWithParameters method of the Moltin SDK to place the order, passing in the user’s contact, shipping and billing details; once that succeeded, we can then call the paymentWithMethod method, passing in the user’s payment details. Once the payment has succeeded, the order is complete! 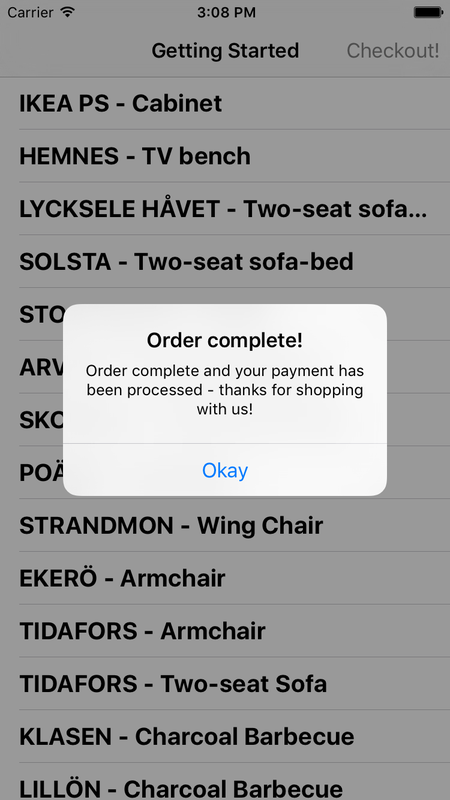 Congratulations - you’ve just built your first iOS eCommerce app with Moltin! For a more thorough example that includes cart, collections, checkout flow and Apple Pay, why not take a look at our Example Objective-C app, or our Example Swift app - both on GitHub. You can check out and download the source code for this tutorial project on GitHub here.